MARPRO PROFILE VICE ADMIRAL WILLIAM BURKE (RETIRED) they can learn about things without putting the ship in danger. They also train routinely on the ships. Navy personnel are usu- ally very comfortable with high intensity, casualty situations on board navy ships.” Conversely, he says, that can’t be done on a cruise ship because you don’t want to disturb the passengers, adding, “In the cruise industry, it will important that we rely on simulation. And we at Carnival have a pretty good program go- ing in that regard. We recently made the decision that we would go to annual, reoccurring training for our bridge and technical offi cers. I can’t emphasize enough how important that is – to be able to put people in situations that are not real but seem real. 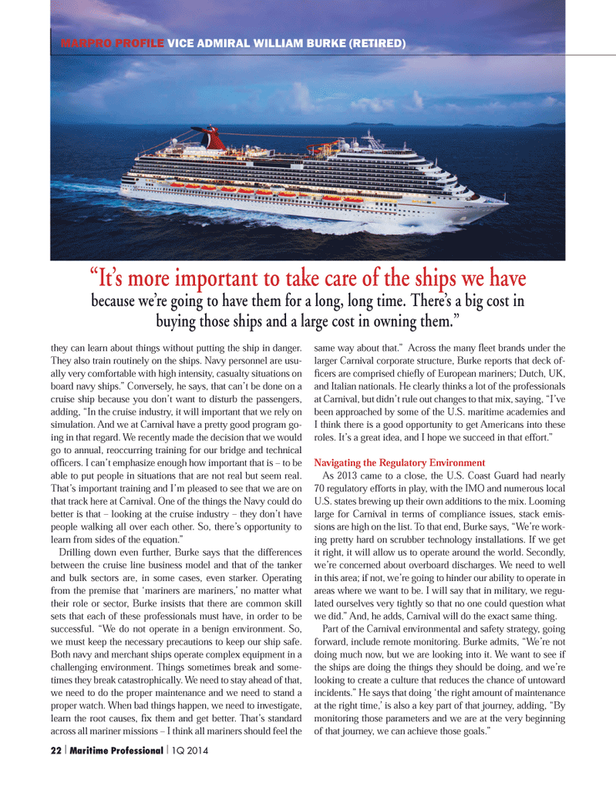 Drilling down even further, Burke says that the differences between the cruise line business model and that of the tanker and bulk sectors are, in some cases, even starker. Operating from the premise that ‘mariners are mariners,’ no matter what their role or sector, Burke insists that there are common skill sets that each of these professionals must have, in order to be successful. “We do not operate in a benign environment. So, we must keep the necessary precautions to keep our ship safe. U.S. states brewing up their own additions to the mix. Looming large for Carnival in terms of compliance issues, stack emis- sions are high on the list. To that end, Burke says, “We’re work- ing pretty hard on scrubber technology installations. If we get it right, it will allow us to operate around the world. Secondly, we’re concerned about overboard discharges. We need to well in this area; if not, we’re going to hinder our ability to operate in areas where we want to be. I will say that in military, we regu- lated ourselves very tightly so that no one could question what we did.” And, he adds, Carnival will do the exact same thing.